A new study was released proves once again just how harmful a $15 minimum wage can be. The study, conducted by the economic consulting group PFM, found that raising the minimum wage to $15 an hour in Montgomery County, Maryland, would cost the county 47,000 jobs over the next five years. That job loss is equivalent to $396.5 million of income. The results are not surprising. Many businesses—such as restaurants—operate under tight budget constraints. So even the slightest increase in operating costs can cause a business to cut hours, slash staff, or even close their doors altogether. These results are similar to previous studies that have also explored the economic ramifications of raising the minimum wage. According to a 2017 University of Washington study, Seattle’s $13 minimum wage caused employee hours to drop by nine percent and lowered the average monthly income for low wage workers by $125. Read more about that research here. Raising the minimum wage has been proven time and time again to negatively impact both businesses and their employees. So instead of artificially raising wages for entry-level workers, let’s increase wages organically by equipping young people with the skills and experience needed to attain a good-paying job. 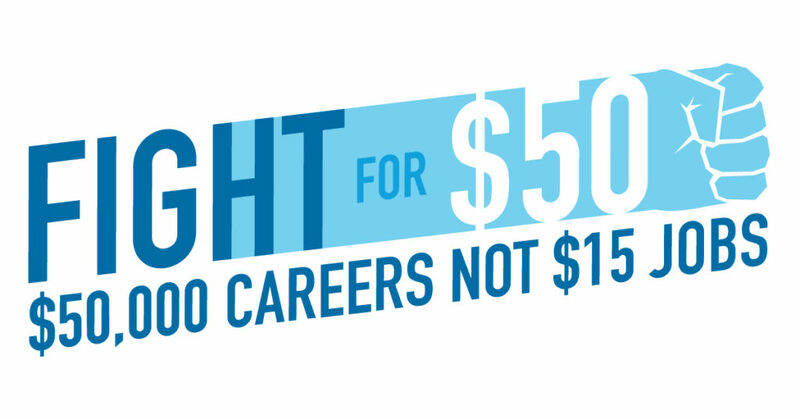 Don’t fight for 15, fight for 50—as in $50,000 careers. Learn more about the fight for 50 at FightFor50.com.